Purple Day is an annual international event aimed at raising awareness of epilepsy. It has been held on March 26 since 2008. The idea of an awareness day for epilepsy was created by Cassidy Megan of Nova Scotia, Canada, in 2008. Cassidy was only nine years old at that time. She was motivated with her own struggles of epilepsy. Cassidy wanted to get people talking about the disorder so that those with epilepsy would realize they are not alone. She also wanted to dispel common myths concerning epilepsy. Cassidy's idea was supported by the Epilepsy Association of Nova Scotia (EANS). In 2009, the observance went international thanks to the joint effort of EANS and the New York-based Anita Kaufmann Foundation. The event is coordinated by the Global Purple Day Planning Committee. 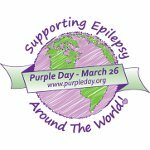 On March 26, people are encouraged to wear something purple or lavender, because these colors are often associated with epilepsy. The Committee also encourages organizations and individuals all over the world to hold and participate in events aimed at raising awareness about epilepsy as well as make donations. Purple Day is not the only awareness day dedicated to epilepsy. On the second Monday in February, International Epilepsy Day is observed.